Classic green beans casserole is given a modern overhaul. No canned ingredients in this fresh twist on the casserole. Enjoy! 1) Combine parsley, 1 tbsp. EVOO, garlic and lemon zest in bowl; set aside. Heat 1 tsp. oil in 12 inch nonstick skillet over medium heat until shimmering. Add mushrooms, shallots, and pepper; cover and cook until mushrooms have released their liquid, about 5 minutes. Uncover, increase heat to high and cook stirring occasionally until mushrooms are golden, about 8 minutes. 2) Heat remaining 1 tsp. oil in now empty skillet over medium heat until shimmering. Add green beans and cook, stirring occasionally, until spotty brown, about 4 to 6 minutes. Add water, cover and cook until green beans are bright green and still crisp, about 2 minutes. 3) Uncover, increase heat to high and cook until water evaporates 30 to 60 seconds. 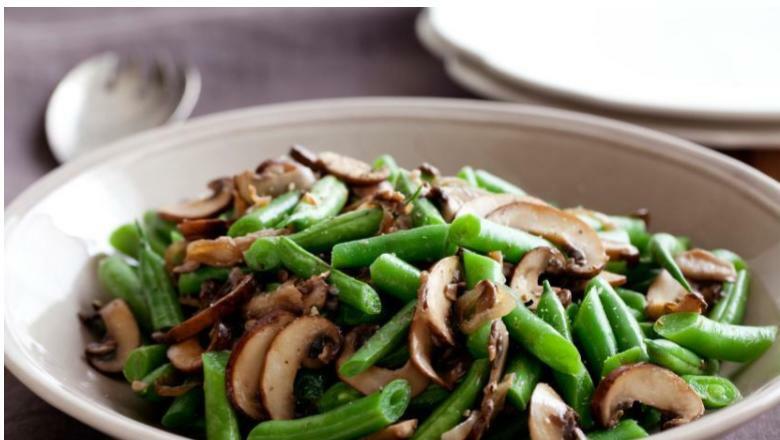 Stir in parsley-garlic mixture and mushrooms and cook until green beans are crisp-tender 1 to 3 minutes. Off heat, stir in lemon juice and season with salt and pepper to taste. Transfer to platter and drizzle with yogurt and serve. Super Food Recipes Magazine Serves 4.